courtesy of Ulisse Perusin, Tweet now has a rocking icon. 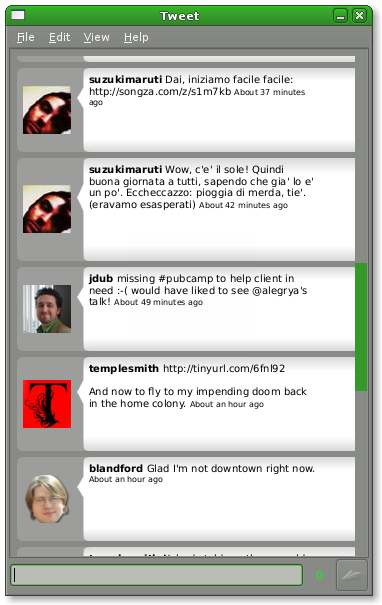 a status icon to show error messages and the number of new statuses inside a tooltip; when clicking on it, it will bring up the Tweet window and, more importantly, it will disappear until the next update. there are still features I’d like to work on before 0.4.0, but all in all current HEAD of master looks fairly stable and useful. if everything goes according to plan, I’ll spin 0.4.0 before GUADEC, and 0.6.0 after I port Tweet to the new shiny Clutter 0.8 API. the first, alpha quality release of Tweet is available here. I’d like to stress out that this is an alpha quality release; I’ve been using it for a while, now, and nothing serious like the destruction of my hard drive happened but I cannot guarantee that it won’t happen to you. you’ve been warned. an icon — can I have an icon? please, pretty please with sugar on top?